Thought Balloons - Creating Comics One Page At A Time: Why Lonely Island? You can find this image on most any "abandoned places" list you'll come across on the internet, but if you start doing any amount of digging, its actual provenance is murky at best. 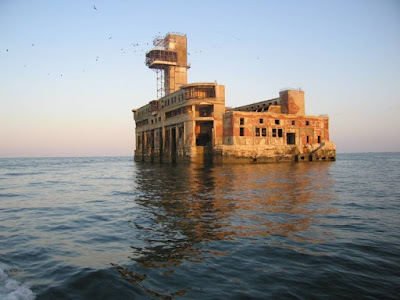 Variously listed as a "Soviet naval testing station", "Eighth factory shop", "marine weaponry test facility", "Dagdizel", and "Dagdiesel", it does not lend itself to easy discovery. If you google those latter two terms, most of the hits are for a defunct soccer team or a Russian engineering firm. 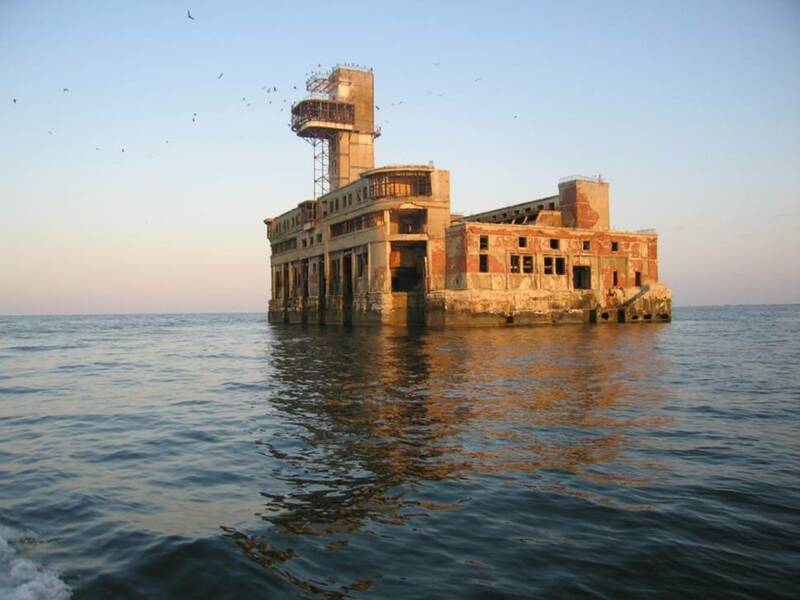 Trying to dig deeper into its backstory, the island facility seems to have been built in the Caspian Sea near Makhachkala, a Russian city I'd never heard of that apparently has a population of over fine hundred thousand souls. It might have gone up during the Second World War. Or it might have been built later than that. Either way, it hasn't been used much of late and its web presence is frustrating, to say the least. Its latitude and longitude are apparently known, although Google Maps, nefariously terrible at water, does not help you actually see it. The above mystery was a nice bonus when it came to digging into the picture's origins, but the image itself is what really grabs me. This is a building erected on water. As far as it appears, there was not any actual land for it to be built upon. Huge amounts of effort must have gone into the endeavour, and yet, for whatever reason, it was ultimately decided that abandoning the facility was the only acceptable course of action, leaving all that hard work to rot. Maybe your interpretation is different than my own. Maybe its mysterious origin is what speaks to you. Either way, I want to see what this inspires in you, because it's inspired quite a lot in me. I love abandoned structures. This'll be fun.